Most houseplants adapt fairly well to indoor conditions, otherwise we wouldn’t be growing them as houseplants, would we? But a few have a hard time with winter conditions indoors. Low light is one problem (winter days are short and often cloudy), but you can help by moving the plants nearer to a window or placing them under plant lights. For many plants, though, the real problem is dry air. In many homes, keeping the relative humidity much about 30% can be a struggle in the winter, especially in climates where heating is necessary. Yet most plants prefer 50% humidity and greater. The more you heat, the lower the ambient humidity, so the colder your climate, the worse the problem will be. Again, you can help by running a humidifier, by placing the plants on a humidity tray or by grouping plants together (that creates a very localized bit of jungle atmosphere). You can usually manage to get closer to 50% humidity that way and most plants will appreciate your efforts. But that’s not enough for all plants. You can also waste your time by misting your plants (certainly one of the most useless gardening tricks ever invented: it doesn’t help plants in any way). If you want your houseplants to be truly happy, make them feel like they’re in a jungle! Photo: edu.glogster.com. Some—even most—plants like really humid air. 70% or above. That’s too much for people, can create condensation problems and is, at any rate, very hard to maintain indoors in any open area. But you can do so “under glass”: a closed environment where humidity can rise to 90% or more. One easy solution would be to move humidity sensitive plants to a terrarium for the winter. If you cover or partially cover a terrarium, you can easily maintain high humidity. However, many houseplants are too big for a terrarium. But what you can do is to seal them inside a clear plastic bag for the winter. True enough, this isn’t going to look very elegant, but if you really like the plant and the way it looks in spring and summer, is a few months inside a plastic bag that much of an annoyance? Here’s what to do, step by step. 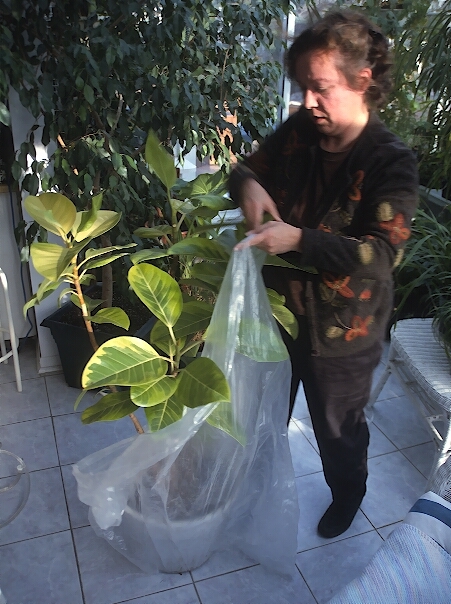 Find a clear plastic bag of an appropriate size (bags from the cleaners are ideal for larger plants). Prepare the plant by cutting off any dead or dying foliage, as dead leaves will tend to rot under high humidity. This is not harmful to the plant, but is aesthetically doubtful. Water the plant normally, then wait a day or two or three: you’ll want the soil to be slightly moist, but not wet. Place it in the bag. Seal the bag shut with a twist tie. Place the plant in a bright location, but away from direct sunlight, otherwise the temperature in the bag could become unbearably hot. Don’t worry if there is a bit of condensation at night, but if there is a lot during the day, open the bag for a few hours to let the excess humidity out, then reseal. Plants sealed inside clear plastic bags will probably not need watering nor indeed any care whatsoever, even after several months. This is truly an ideal technique for laidback gardeners! Don’t worry that your plant will suffocate inside a sealed plastic bag: remember that plants recycle the air they breathe, absorbing carbon dioxide and producing oxygen during the day and absorbing oxygen and producing carbon dioxide at night. The humidity in the bag will reach a very high level, often close to 100%! Leave the plant in its own personal greenhouse as long as you’re heating your house daily. Then remove the bag when humidity levels soar again in spring and summer. Actually, most houseplants other than succulents* would adore spending their winter inside a plastic bag, but they look better uncovered and part of growing houseplants is the pleasure of integrating them into your home décor. So nix that! *Succulents, including most cactus, actually prefer fairly dry air and won’t need special coddling when it comes to relative humidity. However, any plant whose leaves tend to dry up excessively during the winter isn’t giving you much of a show and would be a good candidate for bagging. A plant in a bag: a simple solution of a common houseplant problem! Indoor plants render great services to their owners. They decorate our homes, they purify the air we breathe, they reduce the frequency and duration of colds and flus, and their presence even helps eliminate depression and puts us in better mood (although nobody knows exactly why!). But what do we do in return for them? Very little, except to water them a bit from time to time. At this time of the year, when the days are beginning to lengthen and our indoor plants are starting to emerge from their winter lethargy, there are a few things we could be doing to make them happier: call it a reward for services rendered! Houseplants absorb much of the dust in the air that surrounds them. It’s is one of the reasons they’re so good for our health. Dust is, in fact, one of their main sources of minerals. However, when dust and dirt start to accumulate on foliage, as tends to happen indoors, it clogs their breathing pores (stomata) and the poor plants start to function less efficiently. Besides, there may be undesirable insects hiding on their leaves that you haven’t yet noticed. That’s why houseplants like nothing better than an occasional warm shower, especially after a long winter. Yes, a shower, in the shower stall or in the bath using a telephone shower handset. Just cover the surface of the soil with a rag beforehand to prevent the soil from washing away. If you can, rinse both sides of the leaves. If the foliage is really dirty, even take a soapy cloth and gently rub both sides of each leaf. The plants will love it! After months of being watered in a closed system (irrigation water drains through the pot into the saucer, then is reabsorbed by the plant rather than draining into the surrounding soil as it would in nature), mineral salts start to accumulate in the soil of our houseplants, over time reaching harmful or even toxic levels. This toxicity is even more severe when we fertilize our plants frequently. To eliminate these excess salts, nothing beats leaching! Set your plant in a shower stall, bathtub, or sink and gently run warm water over the soil, letting excess water flow down the drain. Often the drainage water is tinted yellow, a sign that the soil was quite contaminated. Just soak the sol for a minute, stop for 5 minutes (this will give mineral salts a chance to dissolve), then rinse again until the water that comes out of the pot is clear, indicating that most of the impurities are gone. Finally, let the pot drain thoroughly before putting the plant back in its saucer. Over time, most houseplants will accumulate yellowing or brown leaves, dead stems and other defects. Therefore part of the spa treatment should involve a bit of grooming. First, exfoliate… that is, remove dead or yellow leaves. If any leaf tips are brown (often caused by excess minerals in the pot, a problem you just solved through leaching! ), you should be aware they will never turn green again, so just clip them off. Depending on the plant, it may be necessary to shorten or remove broken, weak, or overly long branches. If the plant is heading straight for the ceiling, off with its head! Don’t worry, it will soon grow a new one (that is, as long as it is not a palm: never cut the top off a palm, as they don’t branch in response to pruning!). You can always use the plant’s top as a cutting and start another plant. After a year or two in the same pot, most houseplants are ripe for repotting. Take the plant out of its pot and remove part of the old soil mix: only a bit if you have been repotting annually, more if the plant has spent more than two years in the same pot. If you want the plant to grow in size, repot into a larger pot. If you want to slow its growth, repot into in a pot of the same size. Before reusing the same pot, clean it thoroughly. You’ll need fresh potting mix, readily available in any garden center. For orchids, buy a potting medium designed specifically for them. If you feel a foliage or flowering plant is in poor shape, a move to a very humid environment will do it a world of good. And creating one is easy. Just find a clear plastic bag and seal the plant inside. Don’t worry that it will suffocate: remember that plants recycle the very air they breathe, absorbing carbon dioxide and producing oxygen during the day and absorbing oxygen and producing carbon dioxide at night. The humidity in the bag will reach a very high level, usually close to 100%… and most houseplants adore high humidity! Leave it in its own personal sauna for two weeks, a month, maybe two months… until you see it showing renewed vigor. During this treatment, place the plant in a bright location, but away from direct sunlight, otherwise the temperature in the bag will become unbearably hot. Note too that plants sealed inside clear plastic bags will probably not need watering, even after several months. As mentioned, most plants will love this experience… but not cacti and succulents. Unlike other plants, they can’t handle extreme humidity. Never seal them in a closed container for any length of time. Most houseplants need no fertilizer in the winter and so you probably stopped feeding them in October or November. Well, March is a good time to start again. Every gardener has his or own preferred fertilizers and fertilization frequency and plants are quite accepting in this regard: notably, any fertilizer is fine with them. You can feed your dracaena or African violet lawn fertilizer for all they care: minerals are minerals and much of the labeling pretending one fertilizer is better for plant X than the other is just hype. As you get to the end of your plant’s spa treatment, remember that to remain in good health, your plant will need good light, usually a spot that receives a few hours of sun a day, but without ever becoming stiflingly hot. A location near a east-facing window is ideal because there is reasonable light in all seasons and it never gets hot, so you can leave the plant there all year. South and west exposures are great too, but during the summer, it will likely get too hot near the window and you’ll have to move the plant back a bit. 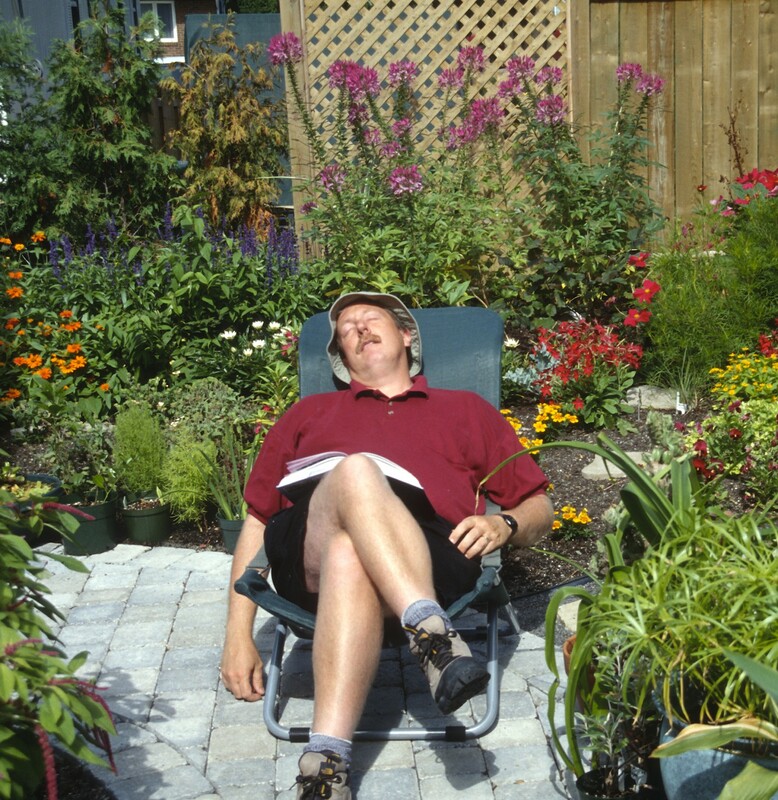 As for a northern exposure… well, it is acceptable (although just barely) in summer, but few plants appreciate it in the winter. Finally, to maintain good symmetry, a plant needs to receive light from all sides… which is almost never the case indoors where all the light in a room comes from one direction, because most rooms have windows on only one side. The plant will then tend to lean towards its only source of light. To compensate for this, remember to give it a quarter turn clockwise with every watering. That will give it light from all directions and therefore better symmetry. Why clockwise? Actually, counterclockwise would work just as well. The important thing is to be consistent and turn it in the same direction each time you water. And there you go! Plant care equal to that of the best spas! Spa treatment will make your houseplants very happy and yet will cost you practically nothing besides a bag of potting soil and, every now and then, one or two new flower pots. It’s the least you can do for such faithful friends!